Zeitgeist Zero track featured on the cover disc the latest edition of Devolution Magazine. ISSUE 45 - METAL MAIDENS & MUSES ISSUE Have you ordered or received your copy yet? 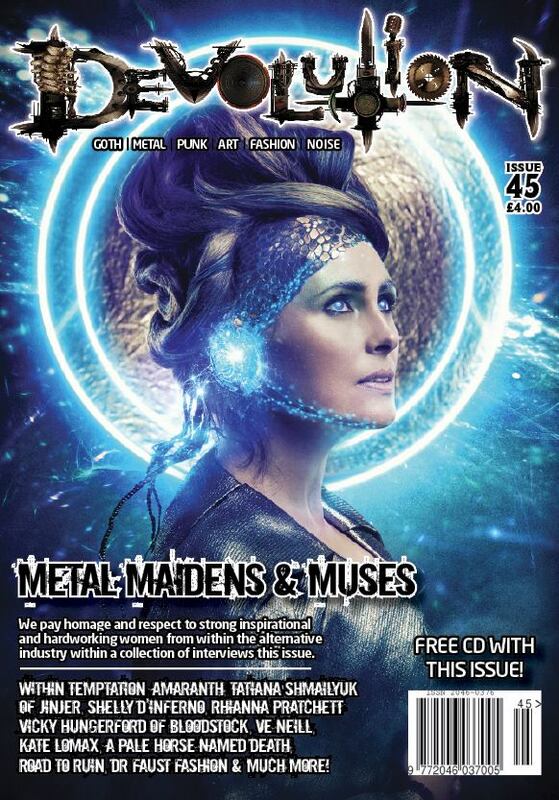 Featuring: Within Temptation – Sharon Den Adel, Amaranthe, Jinjer – Tatiana Shmayluk, Rhianna Pratchett, Ve Neill, Shelly d'Inferno, Weekend Recovery – Lori Janey, Vicky of Bloodstock Festival / Heavy Metal Lifting Club, Faith Roswell, Hollie Pryce-Jones – Bold as Brass Tattoo Company, Kate Lomax Art, A PALE HORSE NAMED DEATH, Dr Faust, Vintage Hair Lounge, Dagaz Dreads, LondonEdge, The Road to Ruin 2019, Stonedeaf Festival. Rebellion Punk Music Festival, Facebarmageddon, No-Hate Festival, The Nightingale Hotel, Bar & Restaurant, Live, CD, Album, Book Reviews & So Much More!